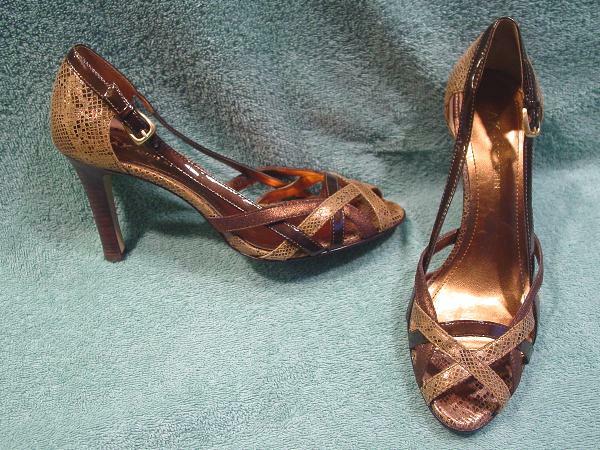 These open toe high heels have leather uppers and manmade soles and are AK Anne Klein. They have brown faux stacked heels and crisscross straps on the front and one on each side to the outer back. The outer one has a gold-tone buckle and prong. 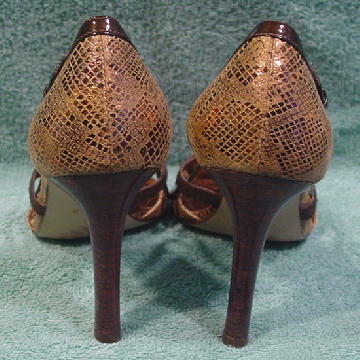 The toe bed, some of the straps, the sides of the footbed, and the back foot heel are in a faux snakeskin in dark brown and gold. The other straps are in shiny brown and golden-bronze. The padded insoles are in a coppery-bronze.